Expat Life with Chickenruby: A visit to the Pyramids, Cairo. Well this is probably one of the greatest construction projects in the world, ever. It took 20,000 people 20 years working 24/7 to construct the Pyramid of Khufu also known as the Great Pyramid and Pyramid of Cheops. It's the only remaining Seven Wonders of the World. 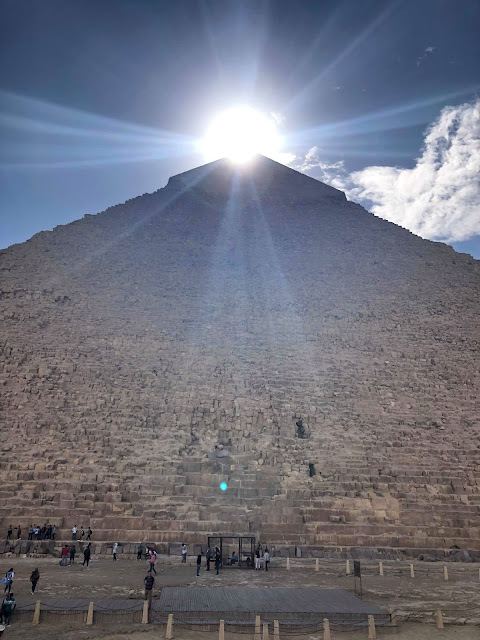 I've been fascinated by the Pyramids in Giza since I was a child, when my father visited there with work and somewhere there is a photo of him sat half way up, in the days when tourism wasn't as prolific as it is now and one was free to wander and climb. I was surprised to see we could still climb certain areas and steps had been cut into the blocks to allow us to do so. It was a very emotional trip for me also, as I can no longer share my travel adventures with my father of places both he and I have visited separately. As with all places we visit for the first time, until we get a feel for a country that is considered dangerous for tourists, we opted to book a tour guide and transport. I wasn’t impressed with our tour, it seemed a bit rushed. 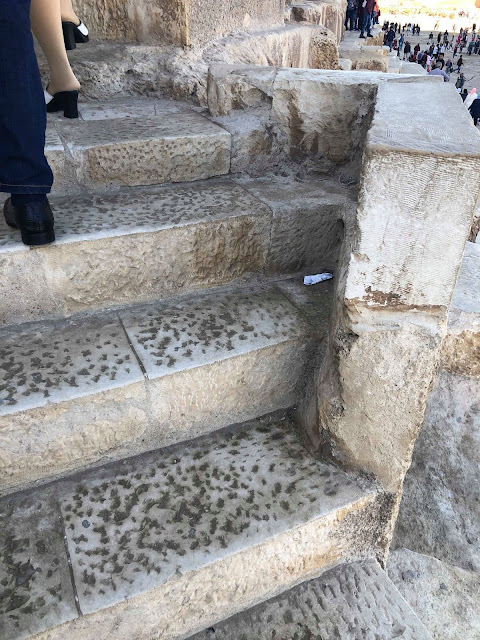 There were several fees to be paid, the tour itself that collected us from the hotel, entrance fee and the choice of entering the chambers of two of the pyramids. Our guide told us there was nothing inside to see and it was hot and difficult to get in and out, but seeing as we were here we should go in the 2nd pyramid as it was cheaper. I’m glad we took the tour though it would have been a long walk up to see the panoramic view or get a horse and carriage ride up there which didn’t appeal. On leaving the bus stopped briefly for a quick photo of the Sphinx at which point we opted to get out the bus to spend a bit more time there and get an Uber to meet friends later. We were warned none stop that we would get harassed by vendors, but our biggest problem was locals who wanted their photo taken with us. It was time consuming only, everyone was super friendly though. We arrived around 10am and spent about 2 hours there, there was a distinct lack of tourists, I’d expected it to be very busy. We've visited Luxor twice now, Valley of the Kings, Karnak and Luxor temple and have been to the Louve in Paris to see many ancient relics from this period. But this is my first visit to Cairo and I’m in love. Wow. I really hope I get there one day!! Wow, what an amazing place to visit. It really is stunning. I can imagine how bittersweet it must have felt to be enjoying it, but knowing that you couldn't talk to your dad about it. 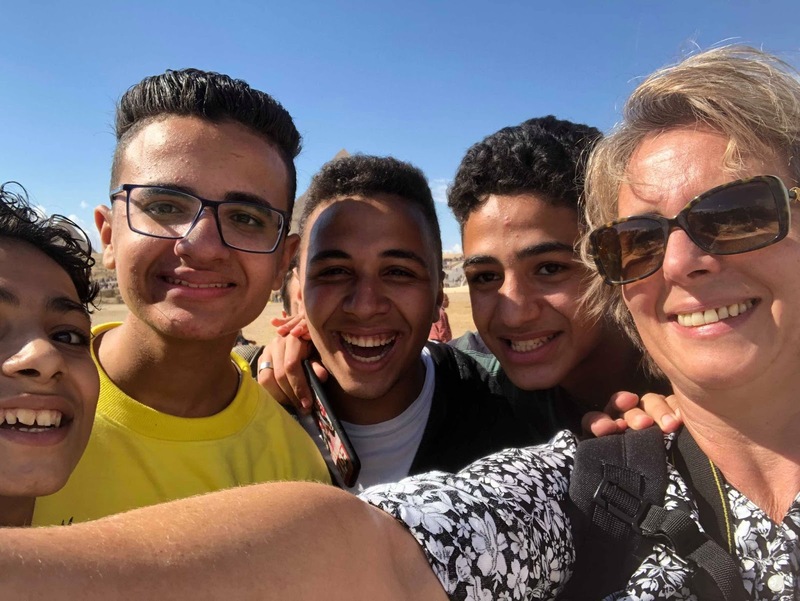 Hi Suzanne, my Mum was actually born in Egypt, spending most of her childhood there (long story) and it surprises me that it has never been a place she has wanted to revisit. Seeing the pyramids must be breathtaking. How such amazing buildings were created in a time when machinery wasn't a thing is just mindblowing. That tunnel looks a little clautraphobic for my liking though. Oh my word, I could bore you senseless with stories of my one and only visit to Cairo as a young, daft backpacker. Three days we were in that crazy city before we realised the map we were using was upside down! Anyway, so sad to see steps have been cut into the Pyramids. I guess that was an attempt to control people climbing on the pyramids as everybody used to do it. In fairness to your tour guide, there is nothing inside Cheops apart from a lot of tourists! Love the final picture, you timed that just right. Oh you're making me reminisce. Wonderful photos. I love the photos and feel like I'm there. I would have thought it would have been packed. 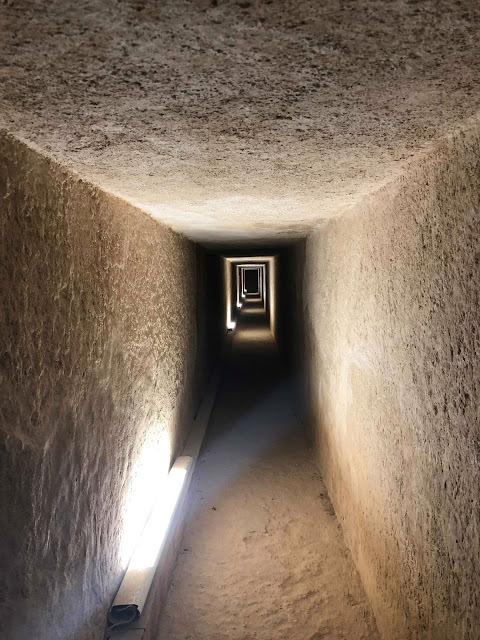 Going into one of the pyramids is not for the claustrophobic tribe! I did it a few years ago, but don't remember which one. We ended up in a big room with a big crypt (tomb) and that was it. But visiting the pyramids in person is very impressive, and not like seeing it on TV. Oh wow, that last photo is so special. I've never been but one of those "must do" places one day.